Yesterday’s golf carts are thing of the past. These days, it’s all about who has the coolest electric vehicle on the block! 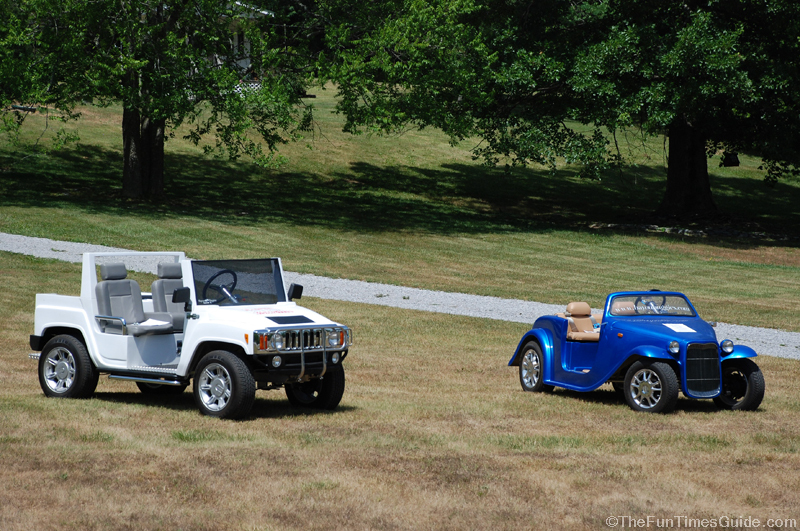 Truthfully, I don’t even think they’re called golf carts anymore… but rather, golf cars! Jim says that a bunch of people at the drag races he goes to have cool & unusual electric cars like these. I first saw these electric vehicles for sale in front of a house here on Highway 96 in Franklin, Tennessee. They look like tons of fun to me! With our new house & property, we’ll definitely need a way to get around our 5 acres and make the mile-long trek down to the mailbox each day. We initially had an ATV in mind, but these fun electric vehicles might fit the bill. I’m putting one of these on my Christmas list! I’d actually prefer to have a Jeep Wrangler one, but the Hummer electric vehicle looks fun, too. Plus, there are lots of ways that you can customize your electric vehicle, including adding a front electric winch (for $1,495), chrome wheels or low-profile tires ($1,400 and $1,800, respectively), or a Sony AM/FM CD player w/speakers ($650). There’s even a mobile video system (…call for price)! 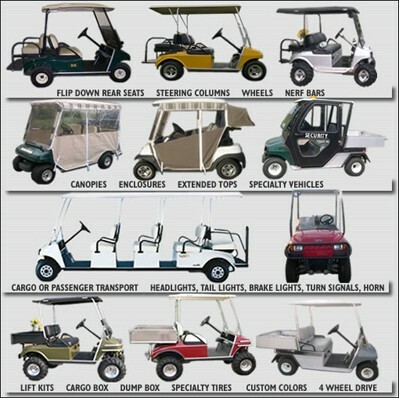 If you need an electric vehicle that has a little more ruggedness to it, then check out golfcars.com. 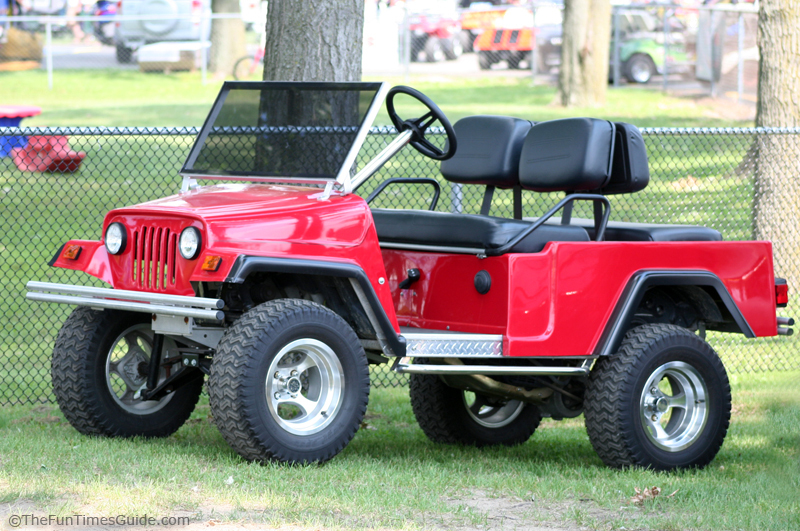 You can build your own golf car from the bottom up — exactly the way you want! Sure, these golf cars can still look cool and be personalized in such a way that yours would be a true original… But it’s their practical design and usefulness that takes priority over their looks. These electric vehicles can be used for golf, driving around the neighborhood, yardwork, campgrounds, working on the farm, transportation around the lake house, driving to and from the mailbox — whatever you need! Do you need a cargo box? Dump box? Head lights? Tail lights? Brake lights? A horn? Turn signals? A lift kit for driving in rough terrain? Specialty tires and wheels? A specific color? Extra seats? Want something simple? Extravagant?… You choose! 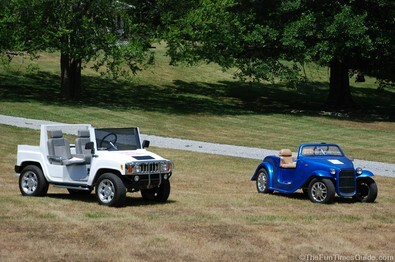 Check out Tennessee Golf Cars! In case you’re wondering, custom golf cars range in price from $2,500 to $15,000 while the luxury electric vehicles can cost anywhere from $8,000 to $15,000. It all depends on the extent to which you add personalized features. The more custom the vehicle is, the higher the price.